If you’re using multiple applicant tracking systems, it likely hurts your pre-apply candidate experience for your company career site. It might force candidates down a path before they even know which path is right for them. For example, I know one major financial company who has 12 applicant tracking systems across 12 countries. I know another major fast food chain that makes the candidate choose from multiple different links of types of jobs because they use one ATS for their salaried positions and another for their hourly. In short, you could quickly lose them. First, let’s look at the reasons you might have multiple ATS’s and the problem it might cause. You have both salaried and hourly/contractor positions. Reason: Perhaps your ATS for the corporate jobs just wasn’t feature-rich enough for your hourly positions. Problem: The candidate now likely has to make a choice. Do they click your salaried jobs or your hourly jobs. You have domestic and overseas positions. Reason: Perhaps you have a country or two that’s either autonomous (picked their own ATS) or you/they couldn’t afford to pay for an extra set of recruiter/user licenses for an ATS in a tiny country (some ATS solutions are surprisingly expensive to add just one or two users to). I have clients who send applicants to email addresses in those cases. Problem: You now may have to have separate country links for the candidate to choose from. You acquired a company that has a different ATS than yours. Reason: This of course happens all the time. With 100+ top ATS’s out there, if you acquire or merge with another biz, odds are they don’t have your ATS. Problem: If you’re trying to merge your companies you’re going to want to merge the candidate experience too. Reason: Perhaps at least one of your brands wanted a different ATS than their sister companies. Problem: Your umbrella/corporate career site should allow candidates to search for jobs at all of your brands. 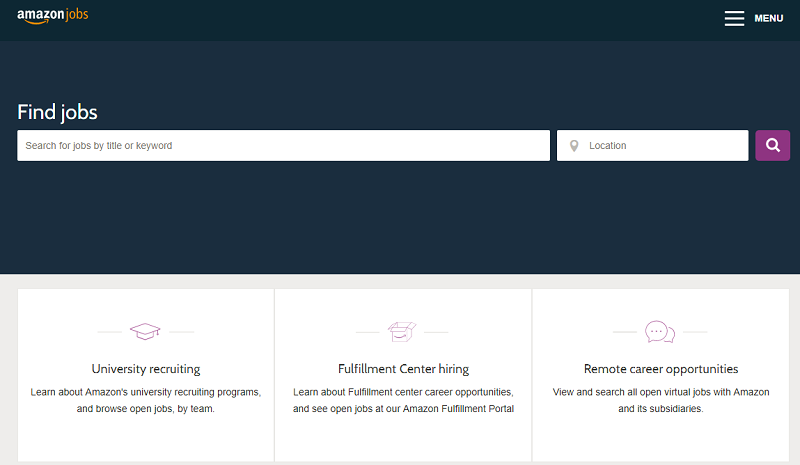 Amazon allows one search box for candidates to search across the jobs they have in both their iCIMS (salaried) and Force.com (hourly) ATS’s. In short, if you have multiple ATS’s, you’re going to have some candidate experience problems. If you have multiple ATS’s, here’s what I recommend. Provide one search box — Check out the screenshot of Amazon above. You can have one job search box that searches across multiple applicant tracking systems (they have iCIMS and Force.com). Not only is this a better candidate experience but if you execute the job search properly, you could see a lift in quality applications of 30+%. Allow “browse by department” — A candidate interested in software engineering jobs wants one click for all software engineering jobs. Allow “browse by city” — A candidate who cares about working in cities wants to see all the cities listed in one place. They don’t want to have to click “United States” jobs to see what cities are and then have to click “EMEA” jobs to see what jobs are in Europe, the Middle East and Africa. The recommendations above need custom software development to map the jobs across multiple ATS’s. Ongig provides unified pre-apply candidate experience as do a number of other great software solutions. Please ping us if you think we could help.